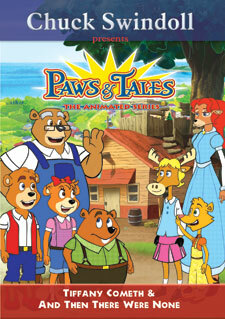 Paws and Tales is children's radio drama presented by Insight for Living, the ministry of Chuck Swindoll. The wonderful, entertaining stories teach biblical principles in a way that is both entertaining and life changing. Through story and song, each Paws & Tales episode serves up a cast of lovable animal characters who experience exciting adventures while learning important lessons to which kids of all ages can relate. And parents love em too! Parents can use Paws & Tales as a resource for guiding their children in spiritual truths. Question and Answers to support these episodes can be downloaded off the Insight for Living web site. See "Tools for Parents."